The neatComponents Discussion Forum is a single configurable component that installs in a click - fully integrated with the site navigation, respecting view permissions and ownership rules. There can be an unlimited number of Discussion Forums, each with individual permissions and controls. You can use neatComponents to construct sophisticated data-table based discussion forums with integrated messaging and many other features. The Forum component provides an instant preconfigured Forum solution with minimal configuration required. Many organizations and commercial websites would like to offer Discussion Forums or Bulletin Boards on their website, but find that incorporating the additional code and hosting complexity means that they cannot justify the expense. Even if the software solution itself is free, there is still the high integration cost. Standard features include access control (e.g. log-in to use), edit control, moderation and full-moderation, and, of course, the normal ability to have multiple threads, rich text and image upload (controlled) and paging display controls. In Full-moderation the system will email the 'moderator' when a new posting is waiting to be approved. 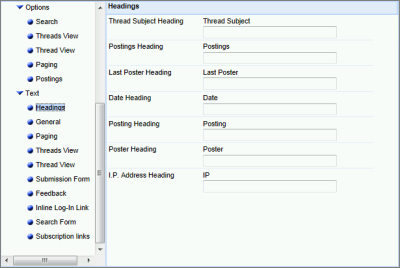 Thread displays include the title of the posting, the author's name, and the date and time as well as the ability to display the poster's IP address for abuse control. The designer can opt to force plain text entries to HTML The Forum component has a powerful search engine associated with it.